Though President Donald Trump still is far from getting his much-desired border wall, his administration took sweeping new action in 2018 to slow legal immigration, make life harder for some immigrants already in the United States, rebuff would-be asylum seekers, and further limit refugee admissions. The administration drew upon the full array of governmental powers, from deploying thousands of active-duty military to the U.S.-Mexico border to executive orders, new regulations, and a flurry of changed practices within federal agencies to act on an issue that resonates strongly with Trump’s base. The Limits of Prevention through Deterrence? 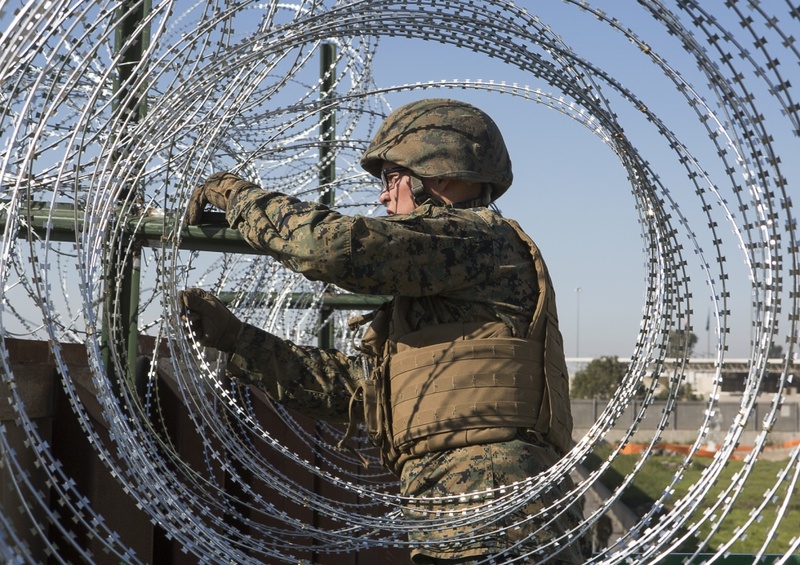 Amid endless media coverage of the several thousand Central Americans who had banded together in caravans to travel through Central America and Mexico en route to the United States and in the runup to pivotal mid-term elections, the President in October ordered the deployment of thousands of active-duty military to the border. Though National Guard members have been dispatched by prior administrations, the contingent of 5,200 soldiers represented perhaps the largest border deployment of active-duty troops since the early 1900s. Family separation, detention of a record number of unaccompanied minors, ending “catch and release” for families seeking asylum, unfurling of razor-wire fencing and use of tear gas, and other practices did not appear to deter Central Americans fleeing violence and instability, searching for economic opportunity, or desiring family reunification: November represented the highest month on record for family arrivals. Removing gang or domestic violence as grounds to request asylum—a path often taken by Central Americans. A federal judge on December 19 declared those restrictions unlawful and barred the administration from continuing the new policies during the initial credible-fear screening process. Decreeing that people crossing illegally between border ports of entry are not entitled to apply for asylum. This presidential proclamation was almost immediately stayed by a court injunction. Limiting the number of asylum applications that can be taken daily at ports of entry and requiring would-be asylum seekers to wait in Mexico, sometimes for weeks or more, before they can approach to request asylum. 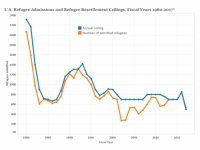 Beyond the border, the administration also set the refugee ceiling—30,000 for fiscal 2019— at the lowest level since formal creation of the refugee resettlement program in 1980. This followed fiscal 2018’s resettlement of the lowest number of refugees in the program’s history: 22,491 admitted in a year when the ceiling was set at 45,000. And DHS announced it would not renew Temporary Protected Status (TPS) for about 195,000 Salvadorans, 57,000 Hondurans, and 9,000 Nepalis who have long lived in the United States with protection from deportation after their countries were designated unsafe for return as the result of natural disaster or civil war. Put back on the immigration court docket more than 355,000 cases that immigration judges had administratively closed (meaning they did not provide an affirmative status but were also not ordering removal). As a result, the immigration court backlog now exceeds 1 million cases. To speed deportations, initiated quotas to ensure immigration judges hear at least 700 cases per year and meet other performance metrics. Expanded use by U.S. Citizenship and Immigration Services (USCIS) of referrals for removal in cases where an applicant for an immigration benefit is found ineligible. Increased its focus on denaturalizing those who may have obtained U.S. citizenship fraudulently or inappropriately. Battled “sanctuary” jurisdictions that limit their cooperation with federal immigration enforcement, taking California to court to force compliance. Changing the Nature of Future Legal Immigration? Beyond seeking to tackle illegal immigration and curb humanitarian arrivals, the administration also took steps in 2018 to reshape the legal immigration system, most notably by issuing a proposed regulation that would impose a “wealth test” as part of an assessment of whether would-be immigrants would be likely to ever become a public charge. Some research suggests the result could be less legal immigration from Latin America, Africa, and Asia. The proposed rule, which could also deny green cards or other immigration benefits to noncitizens present in the United States if they use certain federal benefits for which they are eligible, already is prompting reports of disenrollment by immigrants and their U.S.-born relatives. Though at times stymied by the courts, the administration has arguably been more effective at advancing its immigration agenda via executive-branch actions than it has in any policy area other than perhaps environmental policy and deregulation. Adept at shaping a narrative of a border in crisis and immigration as an economic and national-security threat, even at a time of markedly low apprehensions and a declining unauthorized population, the administration undoubtedly will advance significant new immigration measures in 2019. Michelle Mittelstadt is MPI’s Director of Communications and Public Affairs, and Director of Communications for MPI Europe.